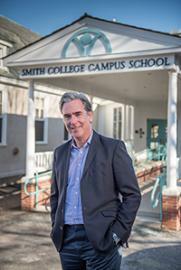 Welcome to Campus School of Smith College. Since our founding in 1926, Campus School has provided students with a challenging, relevant, and meaningful academic program within a nurturing and vibrant learning community. We are the only school in the region that connects the learning resources of a world class college to an elementary school program, and this gives our school its unique purpose and power. Our program and community are enhanced by our work as a laboratory school for the Department of Education and Child Study at Smith College. Being a lab school means that we explore and then employ best practices as well as mentor the next generation of teachers. Our teachers’ engagement with and thoughtful incorporation of new information and ideas encourages the evolution of ever more effective curriculum and instruction. It is a stimulating environment and one perfect for children. The best way to experience our school is in person. We welcome all interested parents to schedule a tour with the admission office. When you visit you will see students and teachers engaged in joyful, meaningful, and purposeful learning.